This post is sponsored by Tillamook, but all opinions are my own. Thank you for supporting the brands that keep The Kitchen Paper running! There are a few dishes that stand out in my mind from my childhood — falafel, German pancakes, and baked macaroni and cheese. My mom had a recipe for baked mac that was my absolute favorite! While she usually fed us heaps of veggies, if I could get her to make mac and cheese I felt VERY accomplished. Nothing says “comfort food” for me quite like macaroni and cheese. It works every time! 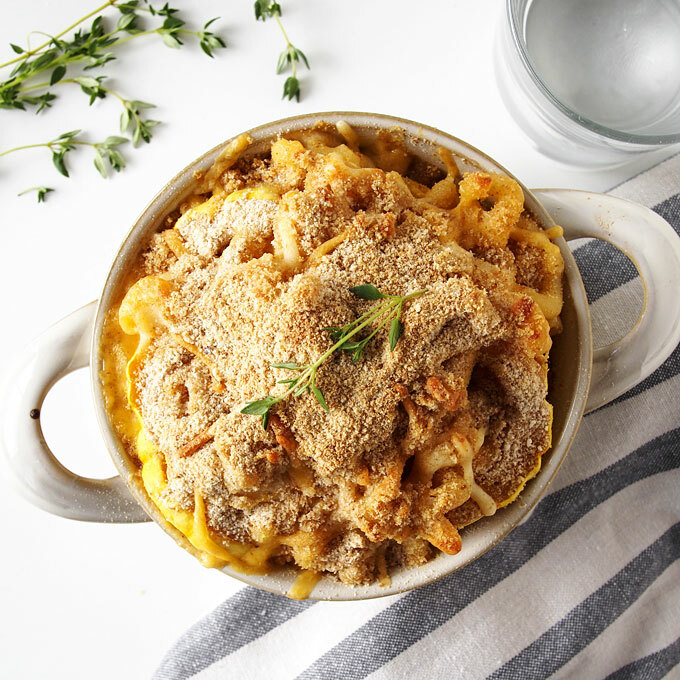 Now that I’m all grown up (let’s not debate that statement…), I still turn to mac and cheese when it’s cold and dreary and I want a little comfort: but now I make it with some twists! 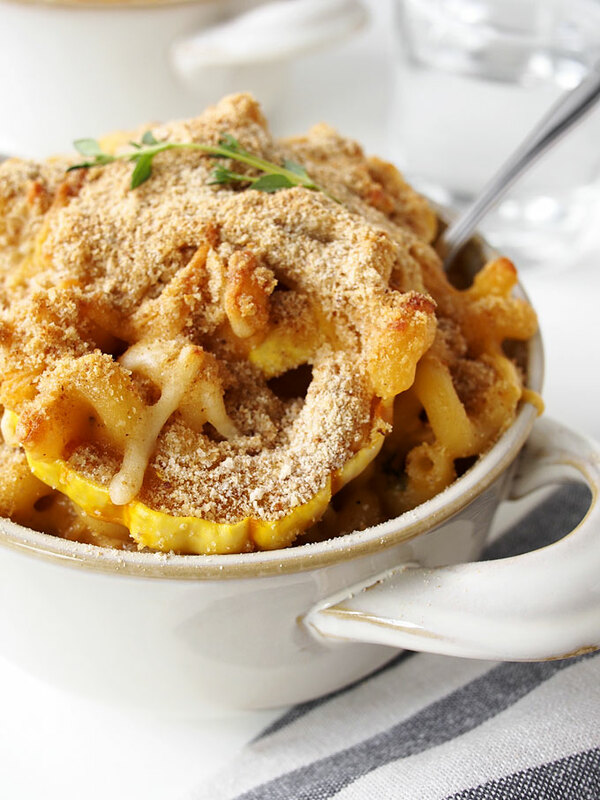 This version has a hefty dose of smoked paprika, roasted delicata squash, and of course: Tillamook Cheddar. I used a blend of Extra Sharp and Extra Sharp White — a great combo for this recipe. Tillamook Cheddar is, for me, another tradition. If you’ve followed The Kitchen Paper for very long, I’m sure it’s been clear that Tillamook is my jam: It’s what I grew up with! I ate an entire pound of their award-winning Medium Cheddar before my junior prom (that’s a story for another time… maybe…)! Ten years later, they’re still making the same, natural cheddar recipe that they have been for the last 100 years. They age it with time, not shortcuts, and keep their dairy clean: there’s nothing to hide in a block of Tillamook Cheddar! Having been to their factory approximately ten million (okay, probably more like 20) times, I know it’s true. You can see every step of the process, and taste their cheddars at various aging points. Maybe that’s why Tillamook has won more than 750 awards since 1909, including “America’s Best” Medium Cheddar in this year’s International Cheese Awards! They’re doing cheddar right! This recipe has a few parts, but I swear you don’t need to be intimidated by it. All you have to do is cook the pasta and roast the squash (both of which can be done ahead of time), then make the sauce. The sauce starts with a roux, and gets all sorts of great flavors along the way. Finally, you’ll mix everything together, top with bread crumbs, and bake. 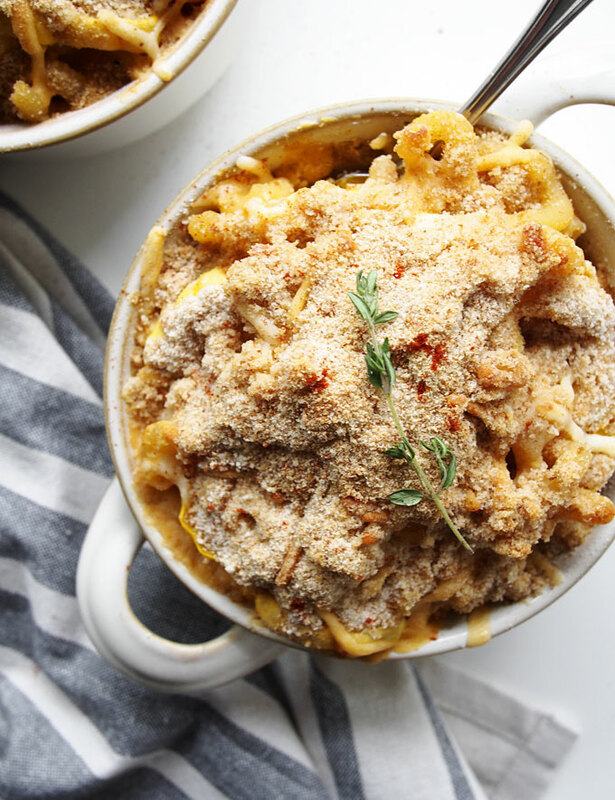 The end result is a superior macaroni and cheese that might just become a family tradition for you, too. 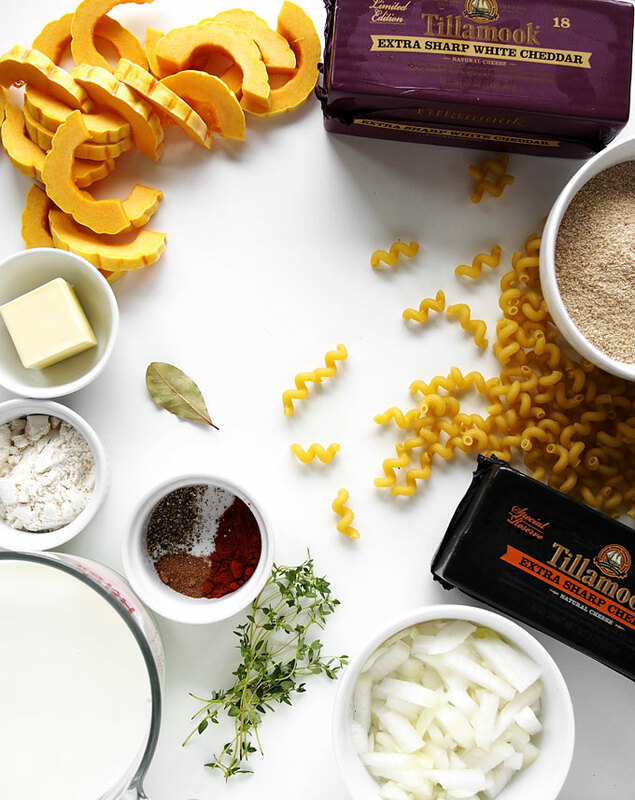 Save $1 on Tillamook Cheddar for your next macaroni and cheese recipe. Download the coupon here. A superior macaroni and cheese recipe that is so good it might just become a family tradition. Preheat the oven to 425 F and line a baking sheet with foil. Cut the squash lengthwise, scrape out the seeds, and then cut into 1/3” thick crescents. Toss with 1 tsp olive oil, ½ tsp smoked paprika, and a generous sprinkle of salt and pepper. Spread evenly on the baking sheet and bake for 10 minutes. The squash won’t be completely cooked after 10 minutes, but that’s okay! In a large pot, bring 8 cups of water to a boil. Cook the pasta until al dente, then rinse, toss with the remaining 1 tsp olive oil, and set aside. To make the sauce, melt the butter in a large saucepot. Add the onion and remaining 2 tsp smoked paprika. Cook for 3 minutes before adding the flour. Whisk constantly, taking care not to burn the roux. After two minutes, add the hot milk all at once and whisk vigorously until smooth. Add the thyme and bay leaf. Bring the mixture to a boil, whisking often, and let simmer for 15 minutes. It will thicken somewhat. After fifteen minutes, add the nutmeg, and another ½ tsp or so (to taste) each of salt & pepper. Remove the bay leaf. Remove the sauce from the heat and stir in the cheeses until fully melted and smooth. Combine the sauce and the pasta, and gently fold in the squash. Pour into a 9×13 baking dish, or smaller oven-safe dishes for individual servings. Top generously with dry breadcrumbs, and bake at 350F for 20 minutes. The top should be turning golden! 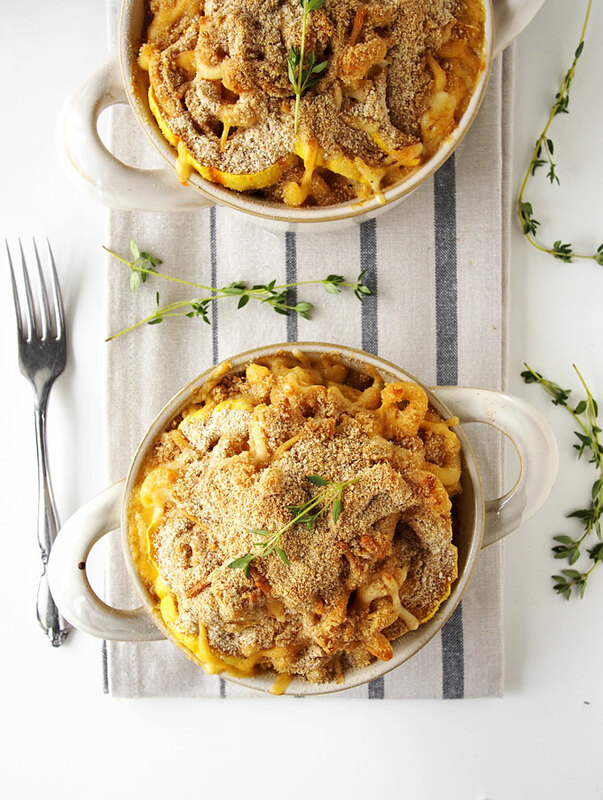 There is NOTHING more comforting to me than a big bowl of mac and cheese…I cannot stop snatching up acorn and delicate squash, so I absolutely LOVE this. I want to dive face first into that mac and cheese.